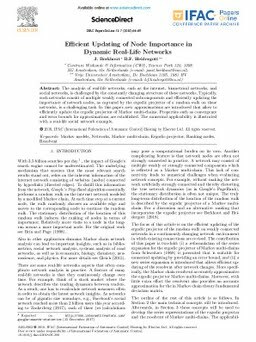 The analysis of real-life networks, such as the internet, biometrical networks, and social networks, is challenged by the constantly changing structure of these networks. Typically, such networks consist of multiple weakly connected subcomponents and efficiently updating the importance of network nodes, as captured by the ergodic projector of a random walk on these networks, is a challenging task. In this paper, new approximations are introduced that allow to efficiently update the ergodic projector of Markov multi-chains. Properties such as convergence and error bounds for approximations are established. The numerical applicability is illustrated with a real-life social network example.